A family’s last name (or surname) can tell us many things about the family and their origins and can be (but not always) a factor in roughly determining the area of Ireland where they came from. Irish family names are a mixture of many previous lines, nationalities and ethnicity, from Norman to Norse and Anglo-Saxon to native Irish. Waterford is not different in the regards and has a large number of last names of Norman origin, the Norman invasion of Ireland having occurred in the South East region of Ireland in the 12th century. Many of these names are now found throughout the world, but particularly on the Avalon peninsula of Newfoundland, Canada, to where a concentrated period of South East folks migrated from 1780 onwards. If we can help with research, or indeed, prepare one of our trails based upon your research, we’d love to hear from you ! My father’s ancestor’s all emigrated from Waterford to the Connecticut Valley towns of Whately, South Deerfield, and Sunderland in Western Massachusetts around 1850. 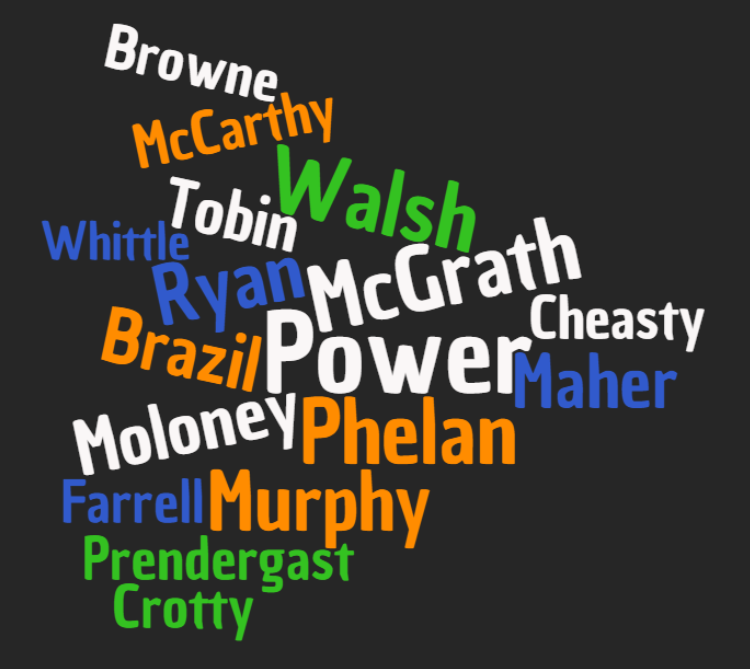 The names of the immigrants are Callahan, Nolan, Hanrahan, Heafy, Walsh, Hayes, Morrissey, and Power(s). Parents of these folks included the names Reardon, Hally, Ryan, Larkin and 2 more Power lines. I believe that these families either knew or were related to each other in Ireland and relayed that this area had both good farmland and was friendly towards Irish immigrants. Research shows names of these families as marriage witnesses and baptismal sponsors in Ireland during better times before the famine. For instance my GGgrandfather Michael Hanrahan’s, son of Thomas and Margaret (Reardon/Riordan), baptismal sponsors were John Hanrahan and Mary Heafy. He ultimately marries a different Mary Heafy (or Hafey as it ended up here) but presumably somehow connected to his baptismal sponsor 2000 miles away. My 3rd great grandmother, Honora/Hanora Brazil, married Matthew Flood on 9 Feb 1834 in Pallasgreen Parish, County Limerick. Witnesses were Patrick Gold and Mary Flood. I know Matthew was from Barna but I know nothing of Honora’s origins.